For the fifth Canadian PLE podcast (and this week’s third), I have an interview with Maria Franks for you. Maria is the Executive Director of the Legal Information Society of Nova Scotia (LISNS). and what PLEAC needs to do to ensure a strong future for PLE. The podcast is available as an mp3, which you can download by clicking here [38 MB MP3]. Let me know, in the comments below, what you think. Another podcast today, this time spotlighting the work and thoughts of Peter Ringrose. Peter has a long history with public legal education in Canada. Decades ago, he worked on early PLE efforts in New Brunswick, where he practiced and taught law. In 1984, he became the first executive director of the brand new Public Legal Information Association of Newfoundland (PLIAN), which he led for ten years. Peter is now the executive director of the Law Society of NL. and whether, as one Canadian MP once said, PLE today is out of big ideas and “just running printing presses” anymore. The podcast is available as an mp3, which you can download by clicking here [38 MB MP3]. As always, I welcome all of your comments. At long last, I’ve had a chance to edit some of the recorded interviews I have on hand. Over the first part of this week, I’ll be releasing three(!!!) new podcasts. and the need for more research in PLE. The podcast is available as an mp3, which you can download by clicking here [42 MB MP3]. If you have any trouble with the file, or any comments on the content, leave a comment here. Wikipedia is a “free encyclopedia that anyone can edit.” This web-based encyclopedia, which the Globe and Mail has called a “glorious social experiment” (and which Wired magazine has called “a repository of knowledge to rival the ancient library of Alexandria”), now has over six million articles in over 250 languages. Until today, there was no article among those six million on PLE, PLEI, plei, community legal education, law-related education, or any of the other fields in our universe. I have spent the morning putting together a starter of an article on PLE [link]. The first job—defining the term—took me all of the morning (plus the months I’ve spent mulling and attempting it already). Take a look and see what you think. And if you don’t like what you see, you can fix it yourself! Wikipedia encourages all readers to “be bold” in editing articles. But staff and volunteers at PLE organizations should take note of Wikipedia’s conflict of interest guidelines [link], which urge you not to link to or trumpet your own organization. I hope this article will grow to become a high-quality explanation of what PLE is, what it does, and why it’s important. Since Wikipedia is becoming a first reference source for journalists, scholars, and the public, the Wikipedia PLE entry could have a big impact on worldwide understanding of PLE. Several of you requested a more printable version of the draft PLEI organization timeline that I posted here last Thursday. I’ve wrangled it down into something that should come out okay on letter-sized paper. I’ve updated and corrected the timeline a little as well. Please continue to pass your comments and requests on to me. Click on the image to download the printer-friendly draft timeline [188 KB PDF]. The podcast is available as an mp3, which you can download by clicking here. If you have any trouble with the file, or any comments on the content, let me know by clicking on the “Comments” link, below. This is the second in a series of histories of major public legal education organizations in Canada. The first looked at the People’s Law School; today, I cover the other sole-purpose PLE organization in BC, the Law Courts Education Society. 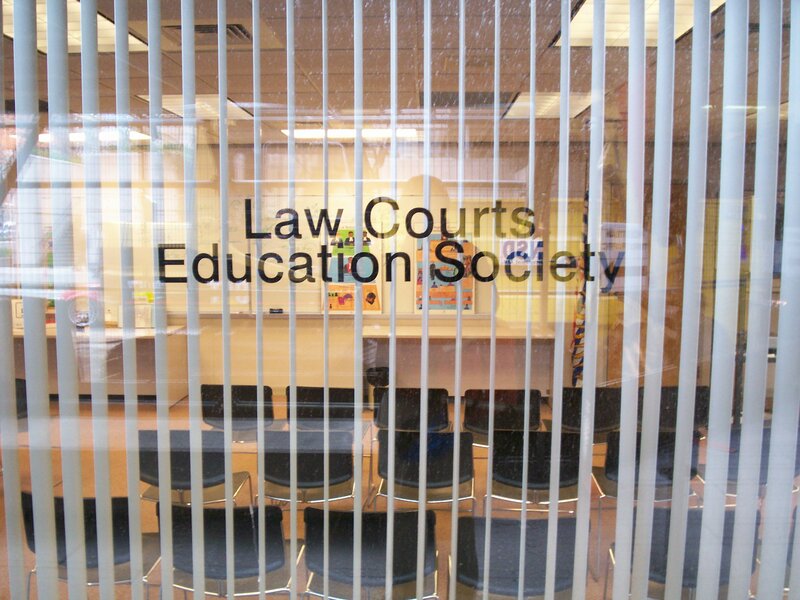 The Law Courts Education Society (LCES) has been a sole-purpose public legal education (PLE) provider since 1989, and before that had been a dedicated PLE program of the Courts of British Columbia since 1979. Today, LCES maintains an enormous palette of programs and projects, centered around court visits, classes, and workshops for students and the community. The Society’s work also includes in-school programs, publications and videos, collaboration on a drop-in self-help centre for self-represented litigants, and both Canada-wide and international projects. In 1979, upon the completion of a new courts complex in Vancouver, the British Columbia courts agreed to collaborate with the BC Ministry of the Attorney General (MAG) on a three-year experimental program to use the law courts to build public understanding of law in the province. The three-year project, enjoying the financial and administrative support of the Court Services Branch of the MAG and the advisory assistance of the BC judiciary, grew quickly to become a successful program. Indeed, the program’s success carried it long past the initial three-year pilot period, and by 1989 it had brought over 150,000 people into the BC courts to learn about the Canadian justice system. Major projects during this time included PLE programming for upper- and intermediate-level school students, mock trials, and special publications and events for non-English-speaking and multicultural communities. One of the artifacts I picked up from my November site visits in Vancouver was a “for air” interview with Gordon Hardy, Executive Director of the People’s Law School. Rather than try to describe it, I hope you’ll listen to it. It is the first “podcast” in a series that I hope to present through this blog. It is an mp3 file, and you can download it by clicking here. It runs a little over twenty minutes. Let me know by email if you have any trouble opening or hearing the file.